Electronic waste (or e-waste) is the fastest growing waste stream, and its disposal is a major environmental concern in all parts of the world. More than 50 million tons of e-waste is generated every year with major fraction finding its way to landfills and dumpsites. E-waste comprises as much as 8% of the municipal solid waste stream in rich nations, such as those in GCC. 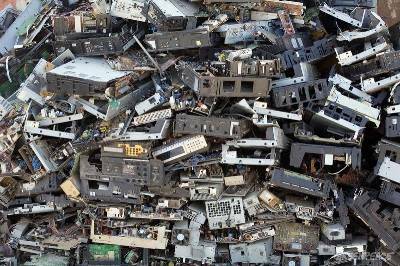 Globally only 15 – 20 percent of e-waste is recycled while the rest is dumped into developing countries. However, in the Middle East, merely 5 percent of e-waste is sent to recycling facilities (which are located in Asia, Africa and South America) while the rest ends up in landfills. The term ‘e-waste’ stands for any electrical or electronic appliance that has reached its end-of-life, such as refrigerators, washing machines, microwaves, cell phones, TVs and computers. Such waste is made up of ferrous and non-ferrous metals, plastics, glass, wood, circuit boards, ceramics, rubber etc. The major constituent of e-waste is iron and steel (about 50%) followed by plastics (21%), and non-ferrous metals (13%) like copper, aluminum and precious metals like silver, gold, platinum, palladium etc. E-waste also contains toxic elements like lead, mercury, arsenic, cadmium, selenium and chromium. E-waste is different from municipal and industrial wastes and requires special handling procedures due to the presence of both valuable and expensive materials. Recycling of e-waste can help in the recovery of reusable components and base materials, especially copper and precious metals. However, due to lack of recycling facilities, high labour costs, and tough environmental regulations, rich countries either landfill or export e-waste to poor countries which is illegal under the Basel Convention. 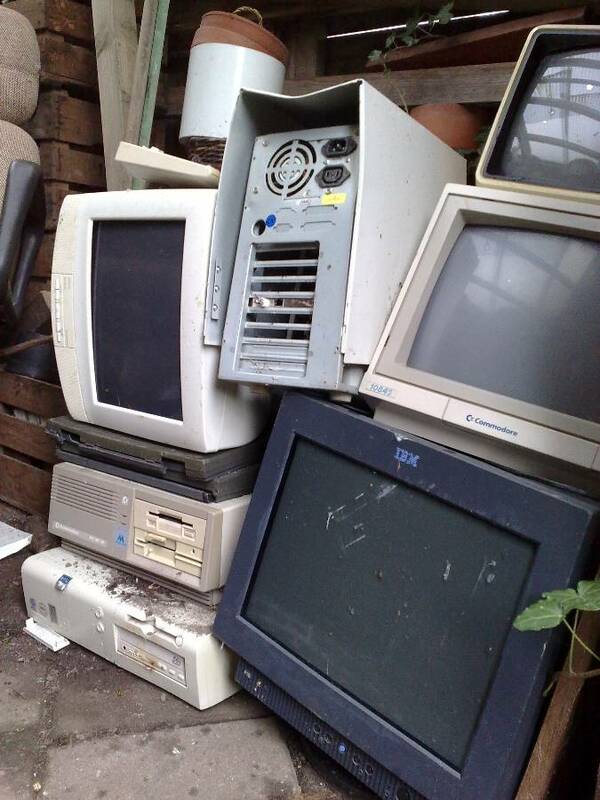 Recycling techniques for e-waste include burning and dissolution in strong acids with few measures to protect human health and the environment. E-waste workers often suffer from bad health effects through skin contact and inhalation. Workers, consumers and communities are exposed to the chemicals contained in electronics throughout their life cycle, from manufacture through use and disposal. The incineration, land-filling, and illegal dumping of electronic wastes all contribute toxic chemicals to the environment. Electronics recycling workers have been shown to have higher levels of flame retardants in their blood, potentially from exposure to contaminated indoor air. Similar exposures are likely for communities where recycling plants are located, especially if these plants are not adequately regulated. Much of the electronics industry in the Middle East, Europe and North America has outsourced manufacturing and disposal to developing countries of Southeast Asia, China and India. Uncontrolled management of e-wastes is having a highly negative effect on local communities and environment in these countries. Electrical and electronic equipment are made up a wide range of materials including metals, plastics and ceramics. For example, a mobile phone may contain more than 40 elements including base metals like copper and tin, special metals such as cobalt, indium and antimony, and precious metals like silver, gold and palladium. Infact, metals represents almost one-fourth of the weight of a phone, the remainder being plastic and ceramic material. Taking into account the fact that worldwide mobile device sale totaled 1.8 billion in 2010, this will translate into significant metal demand each year. If we consider the high growth rate of electronic devices, including cell phones, TVs, monitors, MP3 players, digital cameras and electronic toys, it becomes obvious that these equipment are responsible for high demand and high prices for a wide range of metals. These metal resources are available again at final end-of-life of the device which could be used for manufacture of new products if effective recycling methods are implemented. Mining plays a vital role in the supply of metals for electrical and electronic industry. The environmental impact of metal production is significant, especially for precious and special metals. For example, to produce 1 ton of gold or palladium, 10,000 tons of carbon dioxide is generated. If recycling processes are used to recover metals from e-waste, only a fraction of CO2 emissions will occur, apart from numerous other benefits. Tagged China, E Waste Disposal, e-waste, E-Waste Management, E-Waste Management in Middle East, E-Waste Statistics, Electronic Waste, environment, Health Hazards, India, Metal Industry, Middle East, Mining Industry, Mobile Phones, Recycling, Recycling of E-waste, Recycling of Electronic Equipment. Bookmark the permalink. Yes I agree with that electronic waste (or e-waste) is the fastest growing waste stream, and its disposal is a major environmental concern in all parts of the world, especially developing countries. Recycling of e-waste can help in the recovery of reusable components and base materials, especially copper and precious metals. If recycling processes are used to recover metals from e-waste, only a fraction of CO2 emissions will occur, apart from numerous other benefits. I think we should support PALS because PALS is working for waste management in India and PALS is a group of environmentally conscious people who love pure air want to live in a cleaner and. The cultural indifference and apathy and this is a serious challenge, but the silver lining in these days of low oil prices, shaky confidence and less money in the market, industry & people start to look closer at their waste and what can be recovered from it.